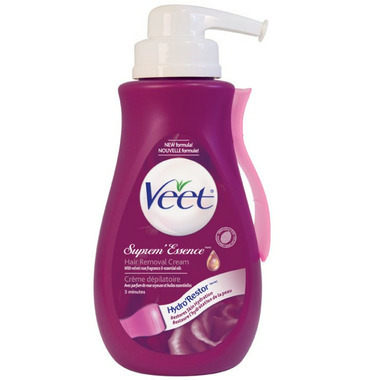 Get touchably smooth skin for up to twice as long as shaving with Veet Hair Removal Cream. Unlike shaving that can sometimes dry the delicate surface of your skin, Veet's HydroRestorTM complex can help restore skin's hydration levels. The Suprem'Essence formula is further enriched with essential oils and has a pleasant, velvet rose fragrance. For effective & gentle hair removal, trust the #1 depilatory brand in the World! Comes with spatula. Odor is well covered but don't forget to keep the fan running or open a window while use. Personally I liked it enough to keep using this, no irritation or itch following directed time. Tried on bikini, armpit, legs, all worked well. So much nicer than shaving. This is a great product especially if you have course hair - it also is fine for sensitive skin. I left it on for the recommend time and it took away all of my leg hair. It didn't burn or itch like other brands and left my legs feeling soft! Will definitely be purchasing this again in the future. I wish it would penetrate the root more for a softer feel - too scared to leave it on longer. I have relatively sensitive skin, and haven't had irritation. The price for this product can't be beet, along with free shipping. This product smells great and works commendably.